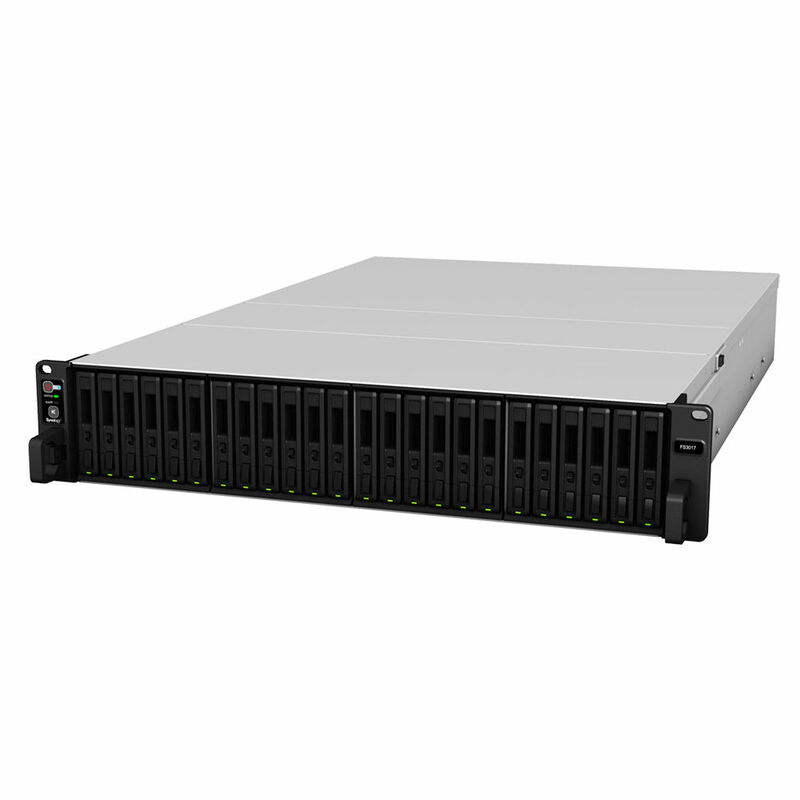 Synology's FlashStation FS3017 24-Bay NAS Enclosure sports twenty-four bays that can accommodate 2.5" SSDs with a SATA or SAS interface, letting you build a custom storage solution for enterprise environments. Your data and assorted apps are quickly processed by the FS3017's two 2.4 GHz Intel Xeon E5-2620 v3 six-core processors and 64GB of DDR4 ECC memory. This level of performance allows the enclosure to run multiple VMs concurrently and smoothly. Once drives are installed, you can configure the drives in a RAID 0, 1, 5, 6, 10, Basic, or JBOD mode using the included DiskStation Manager operating system. Moreover, Synology offers a RAID F1 feature that lets you set a single SSD for most write-intensive operations, so you can swap out a single dead disk rather than risking multiple SSD failures at the same time. Connecting this enclosure to a network is accomplished via two 10GbE ports, which feature link-aggregation and failover support. Additional Ethernet adapters may be installed into the FS3017's two PCIe 3.0 slots. Other notable features include two USB 3.0 ports, two redundant 800W power supplies, and four 80mm cooling fans. With flash-based storage being expensive, the FS3017 supports both high-end SAS SSDs and mainstream SATA SSDs. High-latency, low-random IOPS is the bane of a regular storage array. Dealing with an unresponsive infrastructure is both costly and frustrating. The FS3017 delivers a iSCSI 200,000 4K random write IOPS, thanks to its two six-core Xeon processors and 64GB of DDR4 ECC memory with NUMA integration. You can upgrade the RAM up to 512GB for even more powerful performance. When building RAID arrays with SSDs, it's very common for the disks to all wear out at the same time, due to the evenly distributed workload. With RAID F1, a system-assigned SSD takes the heat for the rest, handling the most write-intensive operations, and is worn out before the other SSDs. This process allows the users time to switch out the single dead disk, instead of risking multiple SSD failures at once. The FS3017 is equipped with two 10GBase-T ports, but if you need more horsepower, it also has two PCIe slots available for adding more Ethernet controllers. Choose between 10GbE, 25GbE, and 40GbE to unlock the FS3017's full potential. In addition, you can leverage iSCSI over RDMA technology to enhance iSCSI performance by up to 80% with an optional purchase of supported a NIC on the FS3017. Synology iSCSI storage fully supports all major virtualization solutions, from VMware, Windows, Citrix, to OpenStack Cinder. Simplify your recovery process with VMware Site Recovery Manager, and initiate disaster recoveries directly via VMware vCenter Server. Synology DiskStation Manager (DSM) is a sleek, browser-based operating system running on every FileStation, which makes managing your Synology NAS a breeze. Featuring an intuitive user interface, DSM makes accessing and sharing your data smarter and simpler. Synology's Package Center lets you download and install useful add-on packages designed specifically for individual or business needs, meaning you can enjoy more entertainment in your life or better productivity at work. Cloud Station is a suitable package to sync files across multiple devices. Files can be edited in offline mode and later synced to Cloud Station, which keeps up to 32 historical versions, allowing you to restore a file back to previous version or recover deleted files. With the mobile app DS cloud, any change made to a file is automatically synced to your smartphones and tablets. For distributed enterprises, Synology's 2-way sync between different DiskStations ensures employees at different locations share the same information in real-time. IT administrators can handpick individual folders that they want to sync to different devices, manually or automatically, based on file format and size. Folders synced by Cloud Station can be encrypted on DSM. The FS3017 offers Synology High Availability (SHA) technology that combines an active and passive server into one cluster, the former always mirrored to the latter. Shared Folder Sync can replicate data in real-time to another Synology NAS at a remote location, giving your business the Recovery Time Objective (RTO) for prompt disaster recovery. With multiple LAN ports, it also ensures redundancy in the event of unexpected network failure. Box Dimensions (LxWxH) 36.0 x 27.0 x 10.0"